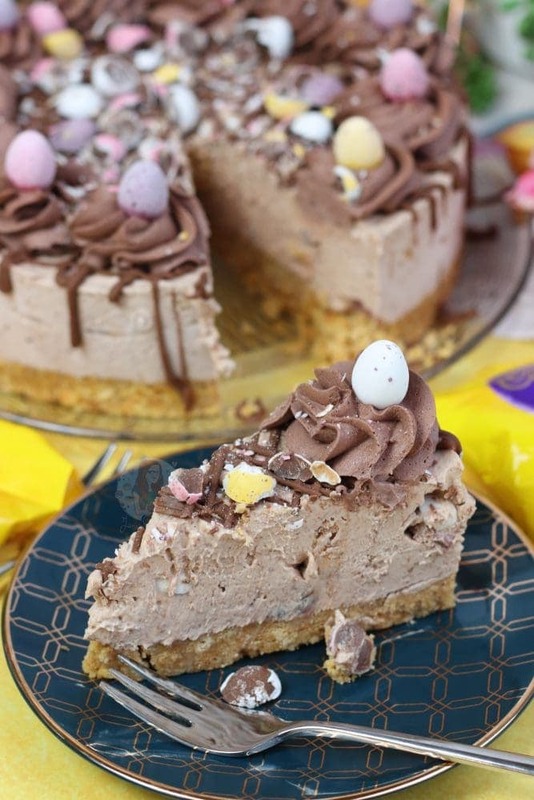 A Buttery Biscuit Base topped with a Mini Egg Chocolate Cheesecake, Chocolate Whipped Cream, and even more Mini Eggs! It’s well and truly peak Easter season, and I am full to the brim of all things Chocolate. I sort of question every now and again if I will ever get to the fitness level I want to be, if I keep on eating this level of Chocolate, but everything in moderation and all. Plus, what’s Easter without chocolate?! Anyway.. 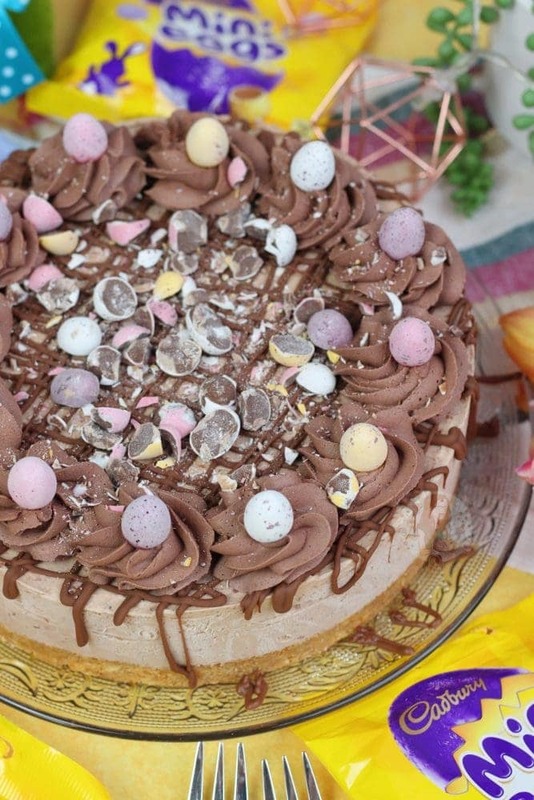 I thought I would post this recipe, as its highly requested and it’s about time that I posted another Chocolate themed Easter Cheesecake. 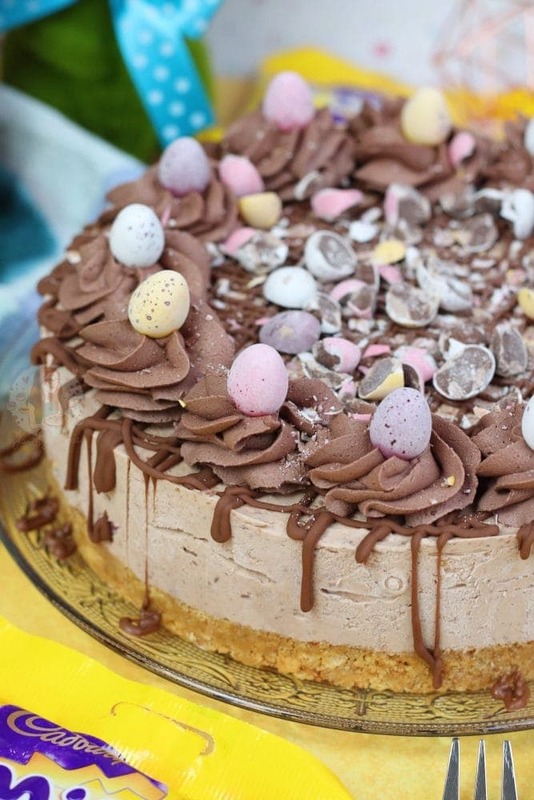 My Galaxy Golden Egg Cheesecake is literally the Galaxy version of this beauty, but I couldn’t resist posting this one as well. 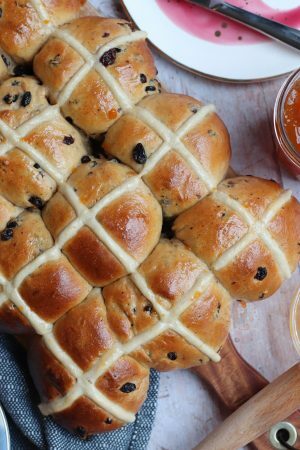 I always have a battle every year about whether I prefer Easter Baking, or Christmas Baking… and each time I change my mind. I genuinely don’t think I will ever be able to fully make my mind up, because they’re both so epic. I adore Easter Chocolates, but Christmas is Christmas… and either way, they are both my most popular times of the year. Having learnt that videos are best for recipes, I have been trying to make videos for most of them. 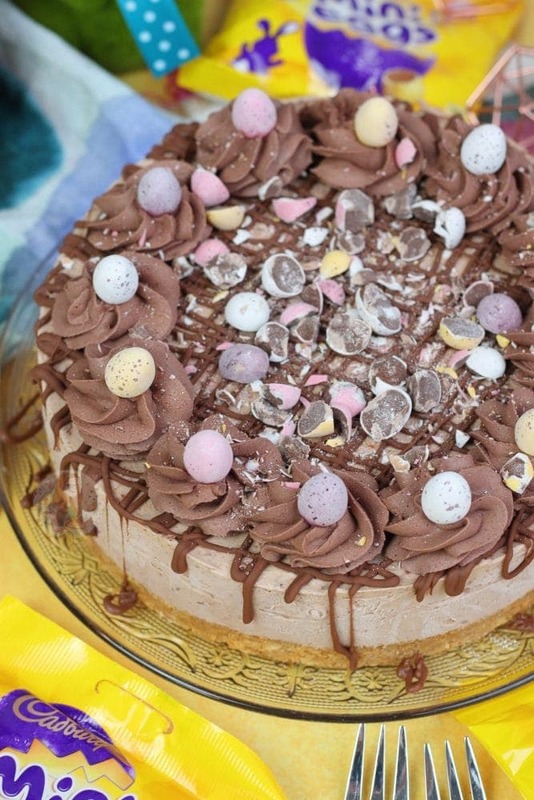 Cheesecakes and traybakes are the easiest, but trying to fit a drip cake into a minute long video has proven a little bit tricky. With this recipe for example though, as I just know the recipe works, I tend to film it as I make it, and then photograph the same one to save myself money and time! I will be the first to admit that my recipes aren’t the cheapest, but that’s because I always mention the brands that I like. I know plenty of followers who use the Aldi/Lidl versions of things, and they work out just as well. 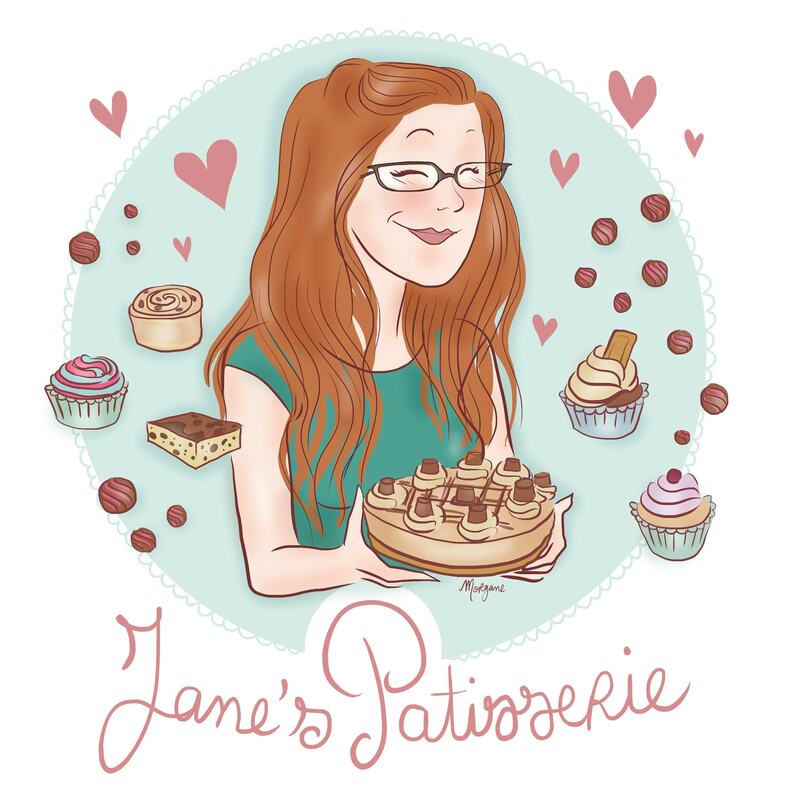 Also, my recipes aren’t designed to be made every day for family life, they’re occasion bakes! For me however, who bakes nearly every single day, my expenses on ingredients is slightly ridiculous. I always get comments on “who bakes what you make? !”, and it can vary from myself, to my friends and family, to my fiancés colleagues, to the baristas at my local Starbucks. 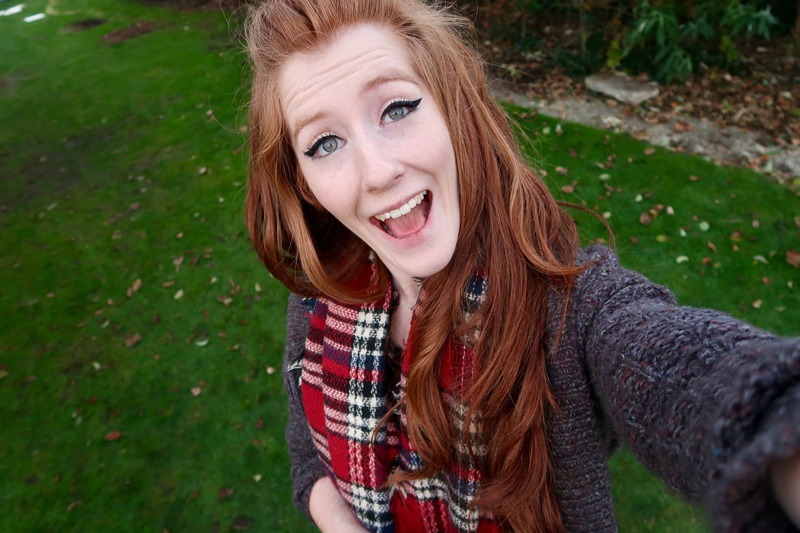 Hardly anything goes to waste, even if it’s not something that ends up on my blog. 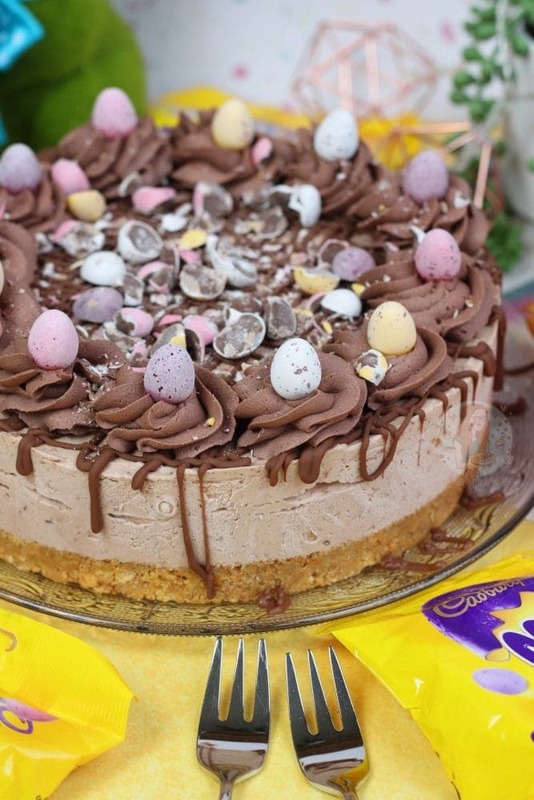 For this, you can use Cadburys as the chocolate you melt into the Cheesecake, or you can go cheaper and use any Milk Chocolate you fancy. I tend to use either Callebaut which is a bit more upmarket, but I bulk buy, or use any basic supermarket own. The cheaper the better really when you have to buy endless amounts of chocolate! However, one thing I just don’t think you can beat is the taste of real Cadbury’s Mini Eggs. They are iconic, and DELICIOUS. 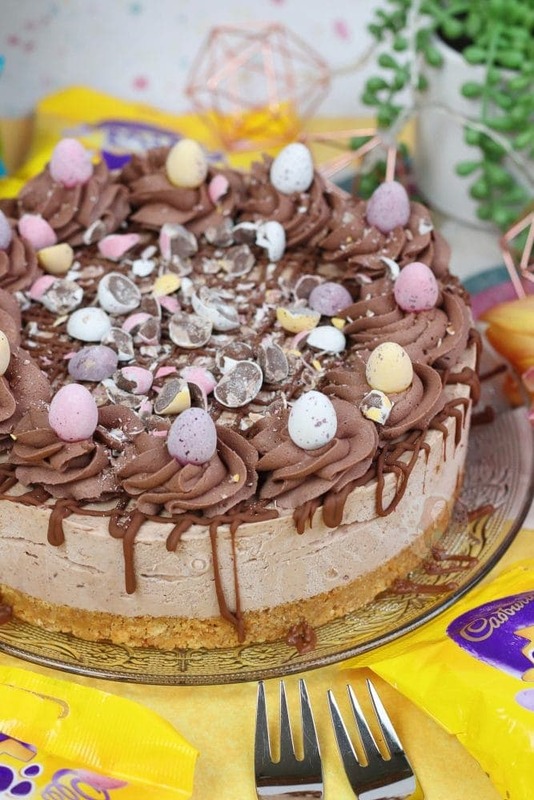 Because I was using chocolate in the actual cheesecake mix, I used slightly less Mini Eggs in this one in comparison to my other Mini Egg Cheesecake, but it worked just as well! Blitz your Biscuits in a food processor to a fine crumb, or bash them up till they are a fine crumb. Melt your butter until liquid, and then mix in with the biscuits. Pour into the bottom of an 8"/20cm Deep Springform Tin, and refrigerate for now. Melt your Chocolate carefully over a Bain Marie, or in a microwave until smooth. Leave to cool slightly. Add your Cream Cheese, Vanilla and Icing Sugar to a mixer with a whisk attachment, and whisk till smooth. Add the melted chocolate to the Cream Cheese mix and whisk till combined! Add in your Double Cream, and whisk again till thick and delicious. The thicker the better, but be careful not to over whisk. Fold through your crushed Mini Eggs, and pour/spread onto the biscuit base. Refrigerate your Cheesecake for 5-6 hours, or preferably overnight. Melt your Chocolate and drizzle over the cheesecake. 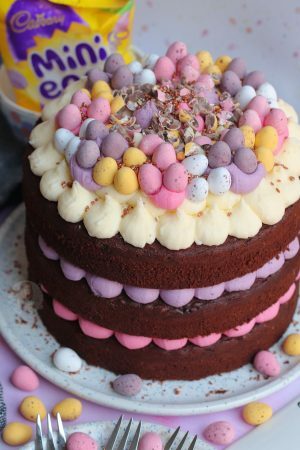 Decorate with Mini Eggs and Sprinkles, or however you please! 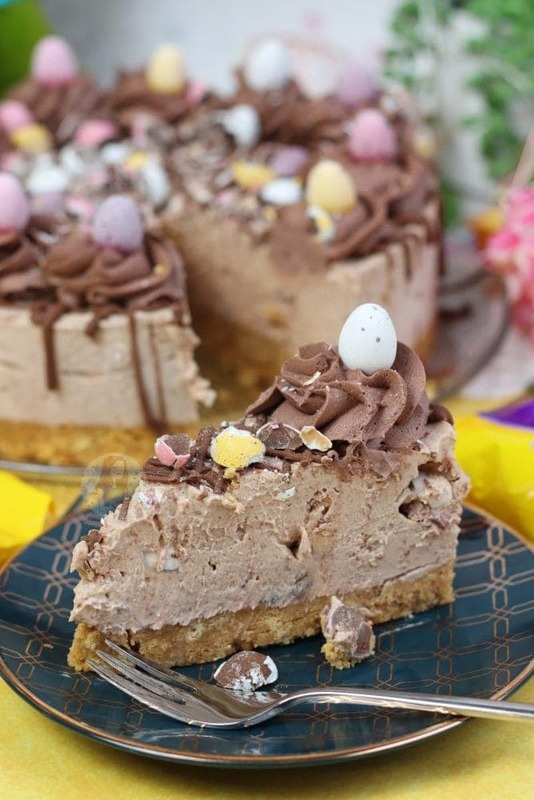 This recipe is based on my Mini Egg Cheesecake - just made chocolatey! This beauty will last in the fridge for 3 days once made! You can use dark or milk in the cheesecake filling, I wouldn't recommend white chocolate as it will be incredibly sweet. The cocoa powder in the whipped cream is optional! You can swap the mini eggs out for the Galaxy Golden Eggs, M&M eggs, etc! 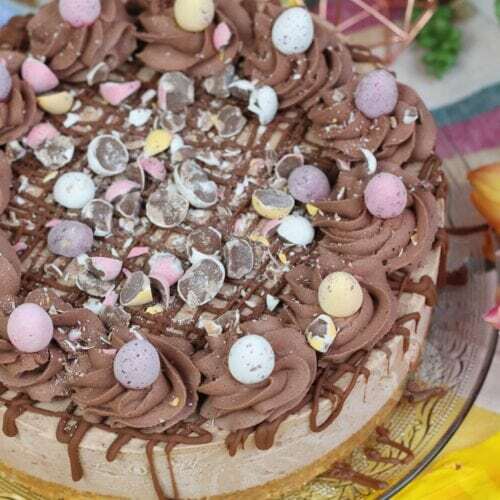 The colour from the Mini Eggs can ooze into the mixture slightly, but it doesn't affect the taste. 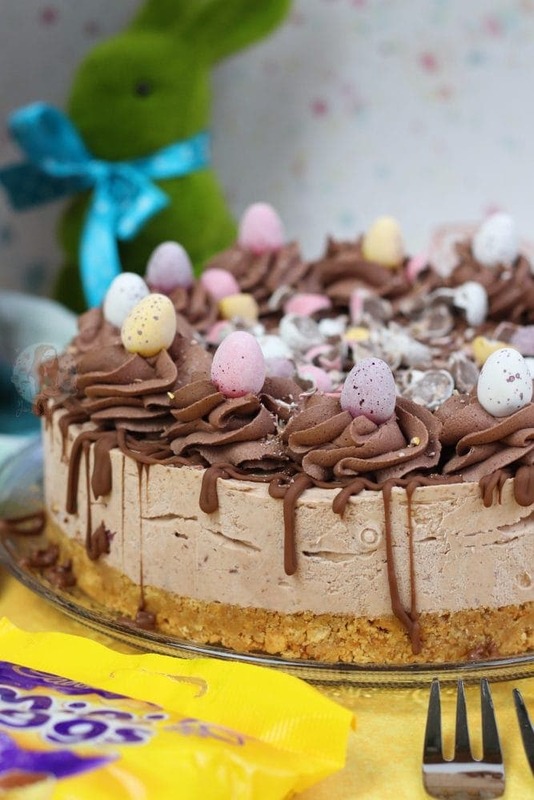 Older Next post: Mini Egg Millionaires Shortbread! 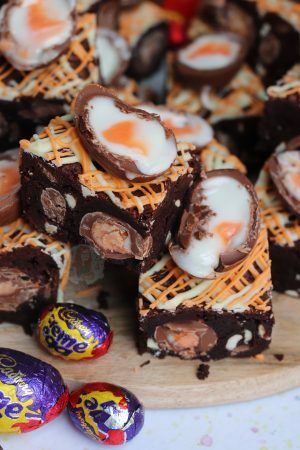 Newer Previous post: Easter Tiffin!